SIX Magazine‘s Adventure Issue is out! Focusing on ethical and sustainable fashion and beauty brands, this publication celebrates style in its own unique way. For this particular issue, SIX tracked down Rose-Marie to find out the makeup artist’s travel essentials. 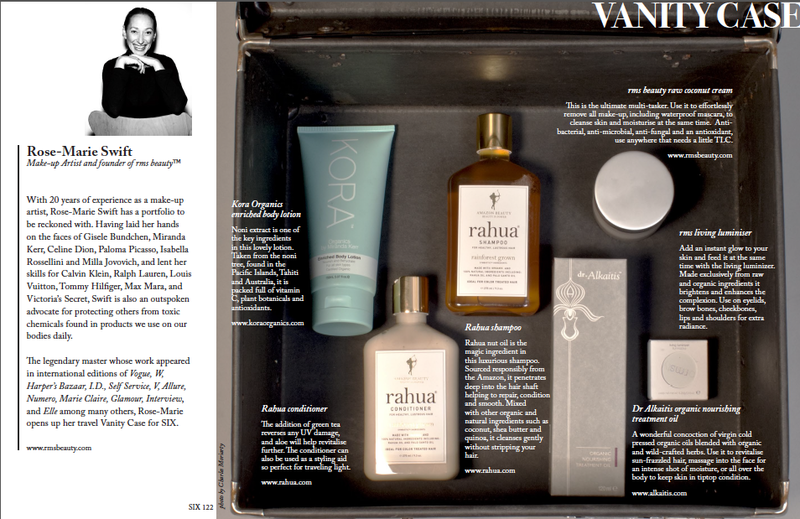 In this edition of Vanity Case, Rose-Marie reveals what beauty products she can’t leave home without. Among them are some top-notch natural brands, including Rahua, Dr. Alkaitis and Miranda Kerr’s KORA Organics. For hair, use Rahua’s shampoo and conditioner, both enriched with organic ingredients sourced responsibly from the Amazon. An added bonus: the lightweight conditioner also doubles as a styling aid. Other multi-taskers included are the rms beauty’s living luminizer and raw coconut cream. Elle approved, the raw coconut cream is perfect for removing makeup, cleansing the face and moisturizing skin–making it a great product for those traveling light. Also, toss the organic nourishing treatment oil by Dr. Alkaitis into your travel kit; this all-in-one product rejuvenates hair, smoothes frizz and nourishes skin.